It’s a common misconception that filth attracts bed bugs. In fact, bed bugs aren’t picky about their environment as long as they have a host to feed on. Their existence depends on getting fresh human (and sometimes animal) blood, so everything else falls into second place. As for clutter and filth, they only provide extra hiding grounds for the population -- something to blend in with, but not a cause of bed bug problems. Why and how do bed bugs spread? Bed bugs need sufficient blood meals at a certain frequency to survive, grow, and breed. And unlike mosquitoes who fly, and ticks who live on their hosts, bed bugs have developed another way to spread and get to their food source. They get caught up on various objects such as suitcases, clothes, and bags, and use those to crawl to places where humans live. Once they find a host, they try to stay close to it so they establish their colony in cracks and crevices near us, hence the name bed bug. If the colony grows too big for the current harbourage area, the bed bugs will disperse to other rooms. The sneaky little buggers will use various ways to get to you. They attach themselves to other people and even objects to travel from one location to another until they find a host. Bed bugs are in for the long run, so they will look for a safe place where they can settle in. Hotels, motels and holiday inns are high-traffic areas where masses of people come and go on a daily basis. Travelling tops the list of risky behaviour because even the best hotels can be infested with bed bugs, if someone brings them in, willingly or not. With the open economy growing and creating opportunities such as Airbnb and CouchSurfing, the risk only increases. Below, we will give you some tips on how to avoid bed bugs in hotel rooms. Items purchased from flea markets and yard sales may seem like a bargain but they are increasingly connected to bed bug problems in UK households. The thing is, you can’t always tell that second-hand furniture is infested with bed bugs. The seller will make sure that it's in a good and clean condition, so it can be really hard for a non-professional to spot the signs of bed bug presence. But don’t be fooled, the fact that something looks clean and preserved doesn’t mean there are no pests hiding in it. Since bed bugs aren’t the fastest runners nor the best jumpers, they will crawl from place to place looking for their next host. They hide in clothes, shoes, plush toys and all sorts of personal belongings when travelling. It’s possible that your child brings back the pest after a sleepover or that you pick some of the insects from a party at your friends’ place. Although you can’t prevent such turn of events, you can still warn your hosts of the bed bug issue--the sooner they know, the faster they will be able to react. If your living arrangement includes sharing spaces with other people, the chances of bed bugs creeping up increase once again, especially if your neighbours have them. When expanding their colony, bed bugs crawl through wall crevices, air vents and other openings to get to their next victim. Even if you are doing everything in your power to prevent an infestation, the insects may appear in your own apartment. Busses and trains aren’t the only public places where you can get bed bugs. Any location where people work and stay for longer periods of time may inhabit the critters--schools, offices and even movie theatres can all become breeding grounds for the bug. From there, it’s a short trip to your home. Bed bugs can get to your home in many ways, most of which you cannot control or prevent. However, there are still some things you can do to lower the chance of bed bugs establishing near you, which we’ll discuss in a moment. When travelling, it’s best to inspect your hotel room, and bed area in particular, for any signs of the insects, as soon as you arrive. Instead of unpacking, place your luggage in the bathroom and check the areas that are most likely to be infested (bed linen, headboard, mattress, box spring) before spending the night in the room. Before bringing in any kind of borrowed, rented or second-hand furniture, make sure to check all fabric folds, cracks and crevices, even if the item is made of solid materials such as wood or plastic. Also, do avoid picking up items from the street, no matter how well-maintained they look. You never know what can hide inside. To prevent bed bugs from entering your own apartment, seal cracks and crevices that may be used as entryways. Additionally, consider buying protective mattress covers, box spring encasements and special pillow covers to prevent wandering bed bugs from taking residence in your bedroom. However, bear in mind that if your next-door neighbour has bed bugs, the above mentioned will not save you from an infestation, so make sure to check if they have dealt with the insect. Do a favour to your fellow citizens, and be careful when throwing away infested possessions. Cover them with plastic first and then put a label or a sign that states the items are infested with bed bugs. Of course, you should avoid donating or giving away such belonging. Since bed bugs feed on blood, their excrements resemble blood spots. The marks can be easily spotted on the bedding and mattress but you can see them in any location bed bugs have been on. You can find bed bug eggs and eggshells in various locations where the insects tend to hide during the day. The eggs themselves are whitish in colour. You can find them in the crevices and joints of your mattress, box spring and furniture. Bed bugs’ life cycle goes through several stages and each time they moult, they shed their skins. Those cast skins are light brown in colour and unlike the blood spots can be found only in harbourage areas. A very distinctive sign of severe infestation is the heavy odour present in the room. Some people describe it as a sweet, sickening smell of almost rotting raspberries. This bed bug alarm scent is released by male bugs to keep other males from mating with them. Spotting an actual bug, be it a nymph or a full-grown bed bug, is the surest sign of an infestation. Nymphs are smaller and lighter, almost clear in colour but will turn red once they are fed. Adults, on the other hand, are brown to red in colour, the size of an apple seed. 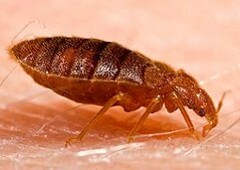 It’s a bit difficult to detect living specimen as bed bugs are nocturnal and notoriously good at hiding during the day. Getting bed bugs is a problem on its own. However, most people tend to act in ways which can worsen the situation, making extermination time-consuming and costly. Luckily, as experts, we can give you some tips on how to avoid just that. Relocating to another room - Nobody is delighted by the thought of being bitten at night. Some people decide that it’ll be a good idea to sleep on the couch in the living room instead. What they don’t know is that bed bugs can trace the carbon dioxide emitted by you and will eventually end up on the couch as well. So in the end, your temporary escape will help them spread further throughout the house. Vacuuming bed bugs the wrong way - Vacuuming is an effective way of lowering the bed bug population because it removes adults and nymphs but not eggs. Yet, you can do more harm than good if you don’t vacuum with a dedicated vacuum cleaner. After you’ve vacuumed the bug clusters, make sure to double-bag the bag before disposing of it outside. Letting the infestation grow - Although bed bugs love to stick around your bed, if the infestation grows, they will migrate to other areas in the room. This is why it’s so important that you recognise the problem as soon as possible. It’s way easier and less expensive to deal with a contained infestation. Disturbing the colony - The reason why bed bugs are mainly active at night is that they can feed uninterrupted and unnoticed. Disturbing the bed bug colony, be it physically or with DIY control methods (that usually don’t work), may cause them to disperse and look for hideouts around the house. This is why inspecting for bed bugs should happen alongside professional control procedures. Make sure that the insect is indeed a bed bug. You can either identify it yourself or trap one and consult with a professional. Gather your clothes and bedding and launder them on a long wash cycle at 45°C. This will destroy some of the bugs that have crawled on those items. Contact a local exterminator and book a professional treatment for your home. This is the only sure way of eradicating all bed bugs quickly and effectively. Don’t dispose of infested furniture. Some items can be spared with a proper treatment, so you needn’t spend more than you have to. Want a professional to inspect your home?